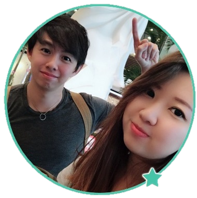 Cheating The Odds 4.0 Scam Review - It's Just a Landing Page! Cheating The Odds 4.0 Scam Review – It’s Just a Landing Page! Some of our readers came across a generic sales page called Cheating The Odds 4.0 and asked if it’s legitimate. Unfortunately, Cheating The Odds 4.0 is a scam and it’s nothing more than a landing page to another scam. If you are here, chances are you have came across a sales page that promises you $1,000 to $3,000 profits today GUARANTEED. You read through the sales page, but you are still not convinced it’s that simple. A free money making software from a stranger? There has to be something more to it. 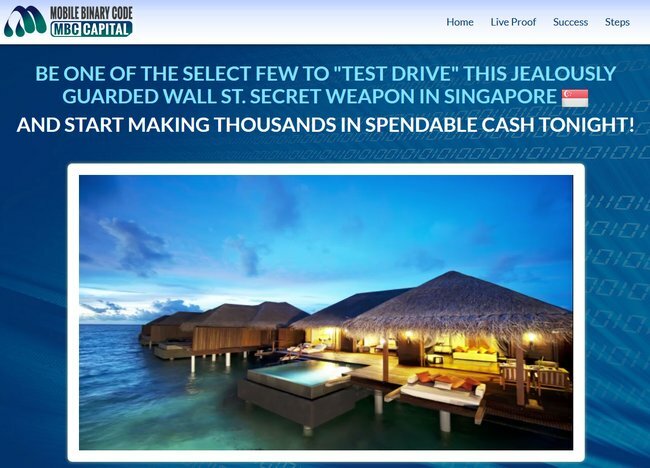 In this case, your instinct is right, because the entire sales page is but a landing page to a binary trading software scam called Mobile Binary Code. As soon as you provide your name and email address for Cheating The Odds 4.0 landing page, you’ll be redirected to another sales page featuring Mobile Binary Code. This transition is used to give you a false impression – that you have been accepted as a member to view the “opportunity” you have been waiting for. In reality, Mobile Binary Code is a standalone scam software that has been around for quite some time. The landing page for Cheating The Odds 4.0 can easily be linked to any other scams because it’s so generic. We’ve received reports of the same landing page linked to other binary trading software such as Compound Trader scam. We’ve reviewed Mobile Binary Code earlier, and you can read the full review here. Mobile Binary Code is a binary trading software that trades binary options for you. The odds of winning binary options is no better than 50%, and you will lose money because you are always risking more in hope of potentially winning a smaller amount (e.g. risking $50 to potentially win $35). You have to deposit at least $250 with its affiliated brokers to start trading with Mobile Binary Code app. Mobile Binary Code uses fake member profiles to boost its credibility. The news quotes shown in the sales page are completely fabricated. Even though their sales materials claim that you are guaranteed to make money, they refute the claims in their disclaimer. The scammers behind Market Buster earn a sum of referral fees as soon as you deposit money with its affiliated brokers. 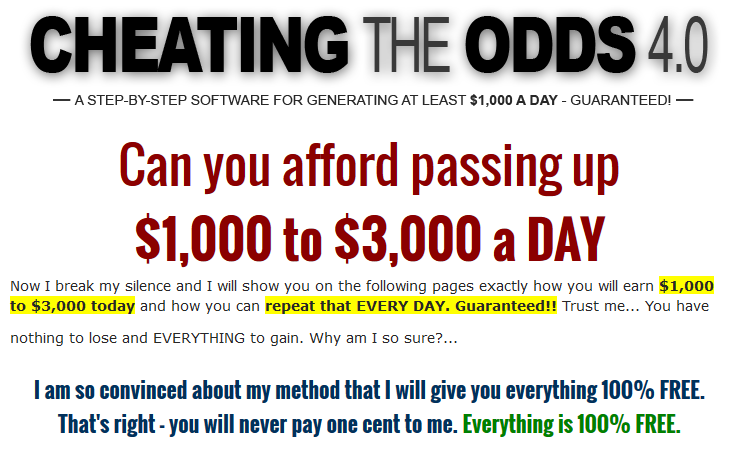 Cheating The Odds 4.0 is just a landing page of Market Buster to lure you into the scam. How Mobile Binary Code Works? In case you haven’t heard of binary options before, here’s how it works and how Mobile Binary Code makes money off you. Binary options is gaining popularity in the recent years due to its simplicity compared to other trading instruments, such as the stock market or the Forex market. Unlike the other trading instruments where traders need to know the market condition, binary options operates more like short gambling sessions. Binary options traders guess if an asset’s price will rise or fall after a short period of time, usually within minutes. Let’s say I predict that the price of oil market will rise after 1 minute, and I bet $50 on a 1-minute options contract. If I’m right, I win a certain percentage of what I bet, usually between 60% to 80%. But if I’m wrong, I lose the entire $50 that I bet. As you can see, the trading process is not that different from traditional gambling. Market movements are impossible to predict in such a short period of time, let alone getting it right consistently. Even if you manage a 50% win-rate, you’ll still lose money due to the uneven winning vs losing payout. The system is designed to work against you while favoring the brokers, because your loss is their gain. It’s just like how casino makes money off the gamblers. What Mobile Binary Code software does it that it trades binary options on your behalf using a set of trading algorithm. Removing emotions from trading may be a good thing, but when it comes to such a short trading time-frame, there’s no algorithm that can predict the market movement and get it right consistently. If you decide to use Mobile Binary Code, you need to register for a broker account through their sales page (which contains an affiliate link). The scammers behind Mobile Binary Code will earn a referral fees as soon as you make the deposit. Even if you already have a trading account with their designated broker, you need to register for a brand new account using a different email address. This is because the scammers behind Mobile Binary Code scam cannot earn their referral fees if you don’t sign up through their affiliate link. 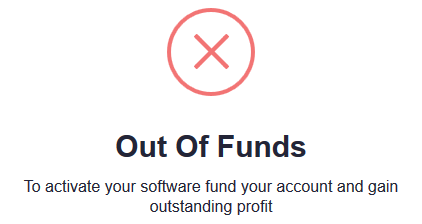 They don’t care if you make or lose money using the software, as you have no way of contacting them even if you try. Their main objective is to make money off you in the form of broker referral fees, and leave you in a financial headache when you inevitably lose money to the market.